The description of worship that is found in the book of Revelation is interesting for many reasons. John tells us that in his vision of the worship of heaven he saw the elders who lead the worship wearing robes (4:4), he saw an altar (6:9), he saw people chanting set phrases repeatedly (4:9), he saw people singing (4:10), and he saw people using incense (5:8). Robes, altars, chanting, singing, and incense – it sounds like the kind of worship that would be very comfortable and familiar to Christians from liturgical traditions such as Anglicanism and Eastern Orthodoxy. Evangelical and Charismatic Christians sometimes like to disparage this kind of worship, but if you were going to base your worship solely on the Bible then you’d have to admit that the forms and practices of liturgical worship are very Biblical. Then I saw a Lamb, looking as if it had been slain, standing at the center of the throne, encircled by the four living creatures and the elders. Notice that the center of worship is the Lamb who has been slain. What aspect of Christian worship most clearly and directly communicates the slain Lamb to us? It is, of course, the bread and wine of Communion. I think this image of the Lamb at the center of worship is one of many places in the New Testament that point us to the central place of Communion in Christian worship. And why not? 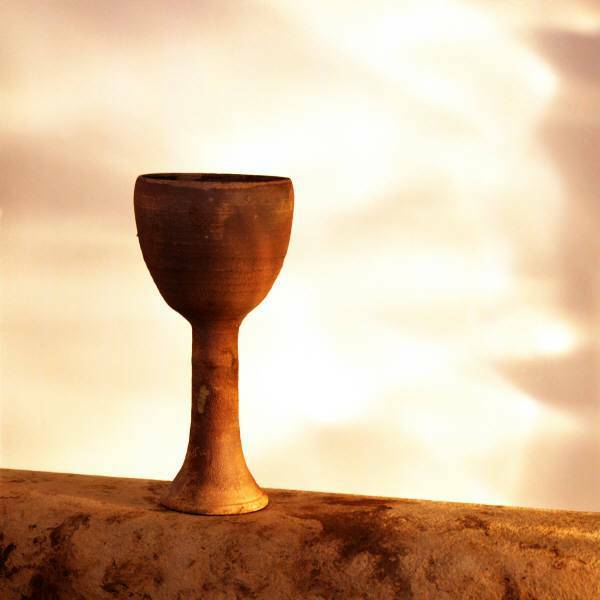 In the bread and wine we proclaim the Lord’s death, by which the death of humanity has been conquered (1 Cor. 11:26, 2 Cor. 5:14). We recognize the risen Jesus in whose resurrection humanity has been raised up (Luke 24:35, Eph. 2:6). And we look forward to the day when the ascended Christ will return to reveal to the whole world their inclusion in him (1 Cor. 11:26, Col. 3:3-4). The Communion table is the center of worship because it proclaims the mystery of our faith: we died with Christ, we rose with Christ, and when he comes we will share in his glory. btw, Ted Johnston has a good post on TheSurprisingGod blog on the role of the ordained clergy. Thanks, Jerome – I’ll check out that post by Ted. So do you take communion regularly? For awhile I attended a small Lutheran church and I loved that! Every Sunday morning the pastor would explain the blood of the new covenant that had reconciled us all to God, the body broken for us all, and welcome who ever desired to come and worship in communion. It was so full of grace and truth, very powerful. Then fundamentalism infiltrated, and all was lost. So sad. I would love to find a congregation that lifted up the Lamb of God each Sunday like that little church used to do. Yes, the two congregations I pastor have been taking communion every Sunday for the past 10 years. I have personally come to believe that a worship service is not complete without the celebration of communion – as you say “the lifting up of the Lamb of God.” I pray you’ll be able to find a church home with the fullness of Christian worship! I am sometimes dismayed at the lack of or minimal communion services in some churches. To me, I learned from Pastor Joel Irusta in Greensboro and Pastor Tim Brassell in Virginia, the Communion is the center of worship and we participated in it each and every week. Where I am going now, it’s once a month, and I feel we are missing something. But I take it to heart and appreciate the communion we do have. I just have make sure I don’t miss that particular service (I have missed one or two). But there are those who do miss church for one reason or another and I think Communion should be available each week so all can rely on the fact that there will always be one and they will not miss out on this important part of our worship. I told my friends, “We’ve been there, done that, not going back”. 😉 But we’ll enjoy the services with them for that night. Going to be very educational. We’ll enjoy it I’m sure. I’m dismayed too! But I remember my own thinking back when I didn’t want to take communion “too often” so I try to be understanding of the cultural traditions that lead some churches to neglect communion. How was dinner with your Rabbi friend? Sounds like you’ve made some interesting connections with that community.